Despite the fact that manufacturers of modern smartphones are completing their offspring with the most modern technologies, you can still find flaws in the resulting devices. Large operating system weight. On the Android operating system, smartphone manufacturers have a tradition to change the user interface beyond recognition. This is done in order to emphasize the corporate style of the model or to supplement its functionality. But as a result, the storage of the smartphone always suffers, into which all the “chips” and add-ons of the system are downloaded. Great application weight. Modern mobile games provide a good opportunity to plunge into the gaming world. But in order for the graphics in the game to be of high quality, it must be created in a very high resolution. And as you know, the higher the resolution, the greater the weight of the image. Incompetent use of phone memory, which leads to the accumulation of many unnecessary files. Since cameras in smartphones can take a lot of pictures in a short period of time, users often take several photos “in reserve”. It does not always take into account the fact that each of them weighs a lot, and therefore takes away precious memory. At the moment there are many ways to clear the memory in the phone on the operating system android from very simple to complex. However, before interfering with the work of the smartphone, it is worth analyzing what occupies the most space and should be removed first. To do this, go to the "Memory" section, which is in the settings of the smartphone. Here, the amount of data occupied by each type of file is displayed as a diagram.. The Android operating system has its own file system in which all phone data is stored. Although in most cases file manager It is not built into the firmware of the smartphone, it can be downloaded separately from the Google Play app store. One of the most common file managers is File Explorer. It provides access to the phone's memory, and also has additional features. In order to remove unnecessary data using File Explorer, you need to go into it and switch to the Home mode.. 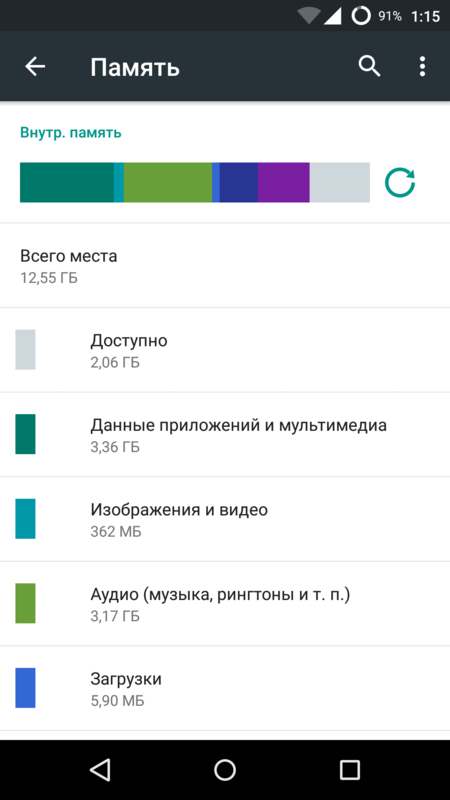 Here you can see how many files take up memory in the device, and delete unnecessary ones in a few taps. As you know, any smartphone on Android can be connected as a USB flash drive to a computer using a USB cable. To do this, you need to download a special program from the website of the manufacturer of the smartphone, for example, Samsung has this program called Samsung Kies. After the drivers are successfully installed, you can open the storage of the smartphone through a computer and delete unnecessary files..
Agree with the selected action. Before you start clean the smartphone memory on androidIt is worth making backup copies of all important files on the computer. This can be done in two ways: via a USB cable and via a Wi-Fi connection, in which both the phone and the computer are connected to the same modem. The way to backup files via USB is understandable even to a child, but with the transfer using Wi-Fi, everything is not so simple. Many users are repelled by the fact that you need to download a separate program, for example, AirDroid. However, after some time of use, it becomes clear that it is much more practical and convenient than a USB connection. In AirDroid, you do not need to keep your smartphone and computer in close proximity to each other, just enough that they are in the same Wi-Fi network. AirDroid also has additional features that allow you to connect to a camera or edit contacts.